Cross Country offers holiday detectors, jeeps and electrodes from industry leader SPY. 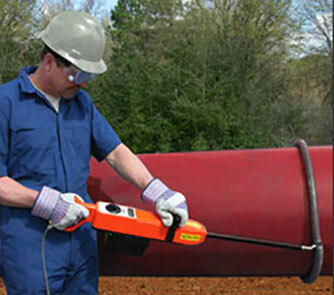 Portable holiday detectors are designed for various pipeline, plant and other surface applications where the inspection surface remains stationary and the detector is moved over the inspection surface. High voltage detectors are used for thicker surface coatings, such as those used on pipelines and other industrial applications. Low voltage, wet sponge detectors are used for thin film applications. Various jeep meters are used to verify voltage of portable detectors. Electrodes are used to transfer voltage from the holiday detector to a surface. Various designs are available to meet type and size requirements. For thin film coatings the easy-carry and easy to handle SPY Model 780 speeds inspection time with its built in jeep meter and various other time saving and comfort features. This ergonomic holiday detector incorporates all the features of the previously manufactured SPY Model 715 detector with numerous upgrades and enhancements. For thicker coatings such as coal tars, extruded and tape coatings, the Model 785 has a range of infinite voltage settings from 1,000 to 15,000 volts. This wide range permits you to maintain a steady inspection rate on most types of coatings on most pipe sizes without changing detectors. Pulse voltage output only. For a wide range of coatings the easy-carry and easy to handle SPY Model 790 speeds inspection time with its built in jeep meter and various other time saving and comfort features. This ergonomic holiday detector incorporates all the features of the previously manufactured SPY Model 735 with numerous upgrades and enhancements. Contact our at 303-361-6797 for available models and accessories.